4-Word Review: Treasure hidden on estate. Jodie Foster stars as Casey a teen living on the tough streets of New York and reselling stolen items for a living. Her abilities come to the attention of small-time crook Harry Bundage (Leo McKern) who gets her to pretend that she is the long lost granddaughter of a rich matriarch by the name of Lady St. Edmund (Helen Hayes). Bundage has become aware through a former servant that worked there that there is a trove of treasure hidden somewhere on the premises and it is up to Casey to follow the clues and find it. I saw this movie when it was released in 1977 and the only thing I could remember from it was the little boy who would slide across the polished floors of the mansion. It’s a surprisingly elaborate plot for a children’s movie, but one that is engrossing and interesting. The characters are believable and diverse and it is fun seeing them evolve and learn to get along. Parents should find this as enjoyable as the kids. I was impressed with the way the filmmakers never talk down to their young audience and trust that they will be sophisticated enough to pick up on the little nuances and subtitles, which the film does have. I found myself longing for this type of family entertainment again. It seems like the family films of today either have kids spewing out a lot of crude nasty things, or they are so sugary sweet and benign that they make you want to throw up, but this film nicely straddles the middle and it really works. Jodie is great in the lead and the movie wouldn’t have worked as well with another actress in the role. The part nicely takes advantage of Foster’s confident, smart, streetwise persona and almost had me believing that the part was written specifically for her. Later I read how the original director for the film, David Swift, dropped out of the project because he felt Foster was ‘all wrong’ for the role even though I felt she was perfect and other viewers should feel the same. Helen Hayes is okay in her role, however the character isn’t all that interesting, nor has that much to do. It seems like once she won the Academy Award for Airport in 1970, which helped revive her career, these were the typical ‘sweet old lady’ roles she was perpetually offered afterwards. However, when it comes to the caricature of an old lady Hayes is absolutely perfect almost to the point that it is hard to imagine her ever being young. David Niven, who plays the butler named Priory, is engaging, but was starting to look frail and elderly. He gets a chance to play several different roles including that of the gardener and chauffeur. The Irish accent that he uses for the gardener part sounded very authentic and I was impressed. His best moment comes at the end when he takes on the McKern character in an imaginative and drawn out duel segment and watching his scared and nervous facial expressions during this is amusing. I liked the other children who play the orphans that Lady St. Edmond adopts. They are cute in a nice genuine way without it being forced especially the young blonde haired boy named Bobby who speaks in a thick cockney accent. Veronica Quilligan plays Cluny one of the older children who are initially an adversary to Casey. She showed the most disciplined and realistic facial reactions to the action around her while the other kids had lost or vapid looks on their faces. Although she appeared to be about 13 or 14, the same age of the character that she played, I was shocked to find that she was actually 21 when the movie was made. I was surprised that there wasn’t a car chase scene as every Disney movie from the 70’s seemed to have one. The action for what it is worth is sparse, but enjoyable without ever getting too cartoonish. The ending where the kids take on the band of adult crooks is good and the scene where their car is stopped on the tracks and the train comes just inches from Priory, who is shielding the vehicle, before stopping is a near classic. I think adults who were kids during this era can watch this film again and still find it entertaining. The kids of today should find enjoyable as well although the ideal age would be between 8 and 14 as I think it is too slow paced for anyone younger. The film also has a good life lesson in regards to teamwork and how working together and taking advantage of each other’s special talents and abilities can help achieve a common goal. 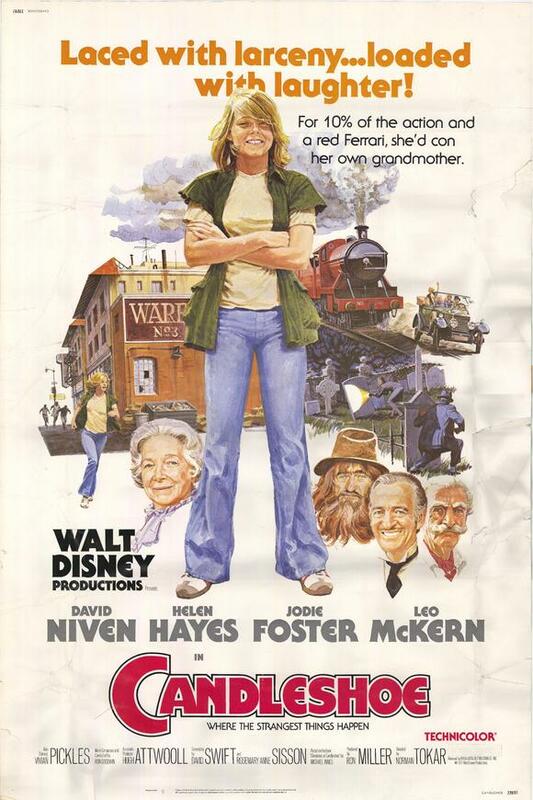 This entry was posted in 70's Movies, Action/Adventure, Comedy, Movies Based on Novels, Movies for the Whole Family, Mystery and tagged david niven, Entertainment, Helen Hayes, Jodie Foster, Movies, Review, Veronica Quilligan. Bookmark the permalink. My kids love this movie, as do I.